Two farmer’s sons have made their mark with a popular restaurant in Hereford city centre. Laura Bowyer visits their enterprise to find out more. It is not the most usual of settings for a restaurant andbar, but the venue of The Shack Revolution, in Hereford city centre, is a modest Dutch barn from the outside, yet oozing shabby-chic decor on the inside. Farmer’s sons James and Rich Manning are the partners behind the business and hail from a family of dairy farmers. Their dad milks 450 Holstein cows at New Cross Farm, Bromyard, justnortheast of Hereford. Video: What is The Shack Revolution? The pair may look familiar, having appeared on two television programmes; First Time Farmers in 2014 and James also appeared as a presenter on Harvest 2015. It was James, the eldest of the pair, who kicked the business off, initially selling fruit from their uncle’s fruit farm. With their uncle being partially sighted, the brothers helped with his business. At the age of 17, James started selling the farm’s fresh,in-season fruit from a van within the county, delivering to about 50 outlets. After this he established Manning’s Juice. Having invested in a pasteuriser and bottler at the farm, he returned to university with the juices, where he sold his product for a higher premium. James completed a degree in agricultural business management at the University of Reading, which he says allowed him to visit many other farming businesses and observe how the owners were still able to have an amount of leisure time alongside farming. During this time Rich helped James along the way and after leaving the University of Exeter with a marketing degree, joined his brother inthe business. In the early days the pair did nothave any funding and operated off the cash flow from their organic growth, although they took out loans from the farm as investments were required. After university James returned home and managed the dairy herd for two years, the juice business taking a back seat. James says: “It came to a time when we either had to employ someone to look after the dairy herd or manage The Shack Revolution. We chose to employ Doug, our herd manager, as we were willing to see someone else manage this process-driven business. “I couldn’t make a margin on the juice as we were just too small. We would have had to go into mass production and compete in a huge market, but at the end of the day, itwas still justjuice. “There’s no real differentiation. We had to change and find a point of difference, so we started mixing juice with fresh fruit in it, which we sold mainly at events.” The pair could not afford to buy abar, so improvised andmade one out of pallets, transporting it in a horse box. Rich says: “We were making this bar in the yard at home and we couldn’t quite think of the right word for it until Mum walked past and said ‘what are you two doing with that shack?’ Then we knew that was the name for it, so we called ourselves the Juice Shack. “We then went to an event in Edinburgh selling juice and came back with lots of cash. We thought we were rich because we had lots of actual paper cash. Appearing on First Time Farmers was a turning point for them, says James. No longer were they just seen as the boys who messed about blending juices, but they were now viewed as serious business contenders. 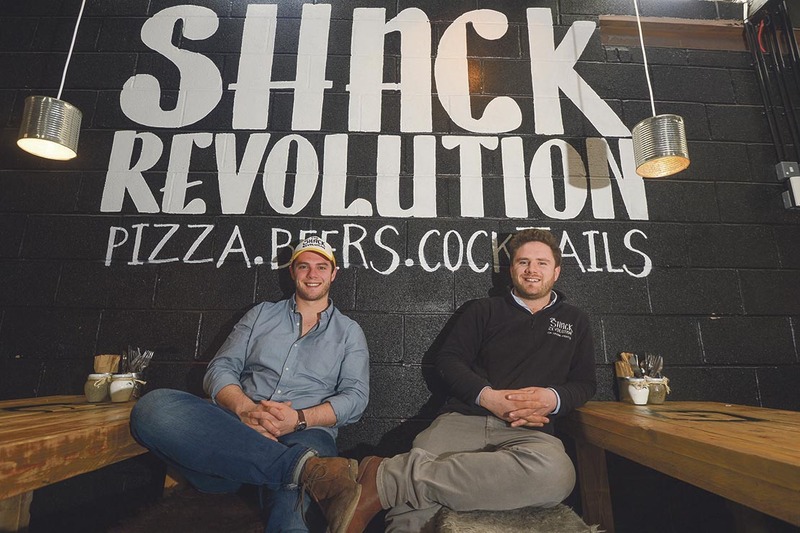 The Manning brothers moved into the site of The Shack Revolution in mid-May 2015, with the aim of running a pop-up restaurant in the city of Hereford over the summer months, selling cocktails, local beers and ciders along with pizzas. Now, the business has a footfall of roughly 1,200 customers each week, 65 per cent of sales on drinks and 35 per cent on food. At Christmas they announced their permanency at the Hereford site, which they ran in line with a social media campaign, giving five winners a £100 tab in the restaurant. The campaign reached 90,000 people and social media has had a massive part to play in getting their business offthe ground. All in all, they have 120 mobile bars available for use. After meeting a concession manager from Wembley Stadium at a London farmers’ market, the boys also have bars in all major stadiums, including the now Principality Stadium, Cardiff, and Wembley. They have 40 units at Wembley, for sports events and music concerts and itis the stadiums which generate the most turnover for the business, followed by permanent bars and thenevents. Providing bars for 65 weddings this year, prospective brides and grooms are able to taste-test the cocktails at The Shack Revolution. The brothers hope to extend their offering via a mobile pizza oven but Rich says a lot of work is required to get catering on theroad. “Last year’s forecasted turnover tripled and in Wembley alone we served 50,000 pints throughout the season. We have seen real growth in the past 10 months,” says James. The pair employ 15 full-time staff, although at busy times up to 250 staff could be working between events across the country. 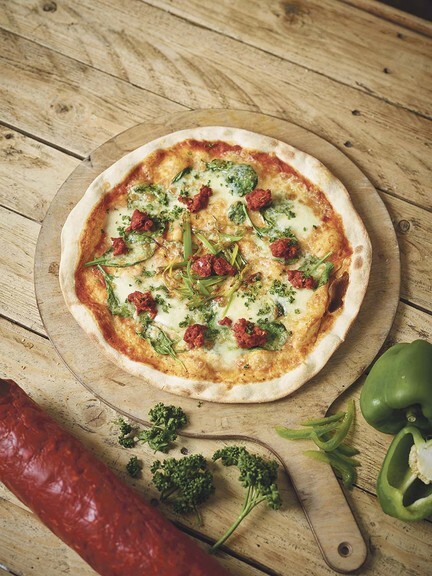 The Shack Revolution’s core belief is to be fun-loving, while staying true to its local sourcing ethos. The brothers are still using the apples from the farm and now hope to work towards using their own milk in teas and coffees to support the family farm. James says: “Dairy farmers are bending over backwards to meet supermarkets’ demands,butthey have no control. Where possible, ingredients are either grown or sourced from within a 40- to 50-mile radius of the restaurant. All meat comes from within Herefordshire and for the cocktails, all juices and spirits are British, bar rum. They press and bottle 39,000 litres of juice each year under their Mannings Juice business, with 30,000 litres going to The Shack Revolution and the remainder to a select number of retailers. Their next step is to can the juice and bring it under The Shack Revolution brand. Rich says: “We also do corporate events with our pop-up bars. We have been to Cannes running bars for Facebook, and we have also done work for BP and Instagram. “You can’t chase corporate work though, otherwise you will end up losing money. You can’t let big companies shave money off your rates and don’t let your business be devalued through charging less. Rich says he spends 80 per cent of his time working on the permanent bar in Hereford, where they also employ Ed, their general manager. The pair want to build and grow their chain, so Rich spends a lot of time on the website and marketing side of things, while describing James as the puppeteer. By next year, they hope another The Shack Revolution will be established in a bigger city, but firstly they say they must get the formula right. “In setting up the restaurant we want a good location with a strong foot fall while ‘shackifying’ the venue,” says Rich.